Yesterday, we began a new Thanksgiving tradition in our family, one that involves three of my favorite things in life: a bit of nostalgia, a feeling of hope and gratefulness, and candy. Specifically, one adorable three dimensional peppermint pig. Recently, my parents traveled to Saratoga Springs, NY, where they learned about the holiday tradition of the peppermint pig. Beginning in Victorian times, each year, as families sat together after completing their holiday meal, a tiny peppermint pig made his way to the table. Someone, probably the hostess, would tuck the pig into a small velvet pouch and remind everyone that the pig is the symbol of health, happiness and prosperity. Soon, the velvet pouch, along with a delicate silver hammer, made it's way to each guest. When the pig reached your plate, it was your job to give the pig a firm tap with the hammer and then share a story of the past year's good fortune with the other guests. It was hard not to become overwhelmed with emotion as I sat and listened as everyone at our family table shared his story. Some guests were grateful for new careers. Others were grateful for good health and new children. Some were grateful for new homes and new relationships. I'm certain we were all pretty grateful for the amazing meal. Last Thanksgiving, even though we had a roof over our head and food in our fridge, I had a difficult time finding the joy in the season. The chef and I had no permanent storefront and therefore no permanent place to prepare the food we needed to prepare for the multiple holiday pop-up markets we were committed to participating in. Most nights, to compensate, we maintained a constant rotation of meat in our small apartment oven (and our neighbors' small apartment ovens) and, in the middle of the night, drove back and forth to the two incubator kitchens we were renting -- one in Brooklyn and one in Jersey. Our bank account was dwindling (i.e. : gone) as we struggled to help our business grow, we were at each other's throats as we tried to keep up, and we both were starting to feel like our dream of opening our own store front was strictly a fantasy. It's pretty unreal how much positive change a single year can bring. It all feels like a lifetime ago, like some set of distant, foggy memories that we didn't quite live through, even though I know damn well that we did. And so yesterday, when the peppermint pig landed at my place setting, there were so many stories of happiness I wanted to share from this past year. However, at the risk of getting too emotional (I'm definitely the one who notoriously cries tears of joy in our family), I picked up the silver hammer and simply said "I'm grateful for our shop." But beneath that statement, what I really meant was that I'm grateful for all the moments the chef and I shared this year that led us to our shop. All the sacrifices we made together, and the many nights when we talked and cried together into our pillows because we were both so afraid. All the moments of small victory and the many moments of defeat and rejection and bad recipes. All the late nights when we blasted music in our kitchen, and spent hours wrapping up trays of braised meat, even though we had to be awake again in three hours. In short, now that we are on the other side of things, I'm thankful for those moments of struggle: all those moments when we learned that we truly have the capacity as a couple to help one another out of dark times and to guide each other into some of the best. It makes the good times taste a little bit sweeter, and makes our commitment to each other feel a whole hell of a lot stronger. Last week, I was thrilled to publish a "Small Batch" column over at Food 52 for these Pickled Chard Stems. I was impossibly thankful to have a few jars of them on hand the other night when two of my girlfriends stopped by unexpectedly to catch up very late on a Friday night. We gathered around my kitchen table as I pulled a few hunks of Vermont cheddar, several half consumed bottles of white wine, and two mason jars of these pickled chard stems from our fridge, quickly assembling everything into some sort of presentable looking spread. It was one of those nights where we sat for hours laughing and reminiscing about the past year, and confiding in each other about all the new memories we hope to make in the year ahead. I'm ever so grateful to have those sorts of friends, the sort who make you laugh until your cheeks hurt and who won't judge you for serving them on-the-way-out booze. So, as I topped off their glasses, I thanked them for stopping by and for forcing me to stop working on social media tasks for the shop. And of course, I thanked them once again for their ovens, too. Thoroughly rinse the chard stems. Trim their ends and remove any remaining leaves with a sharp knife. In a large saucepan, blanch the stems for one minute. Immediately drain the stems and rinse them with cold water to stop the cooking process. Add all remaining ingredients to a small saucepan and bring to a boil. 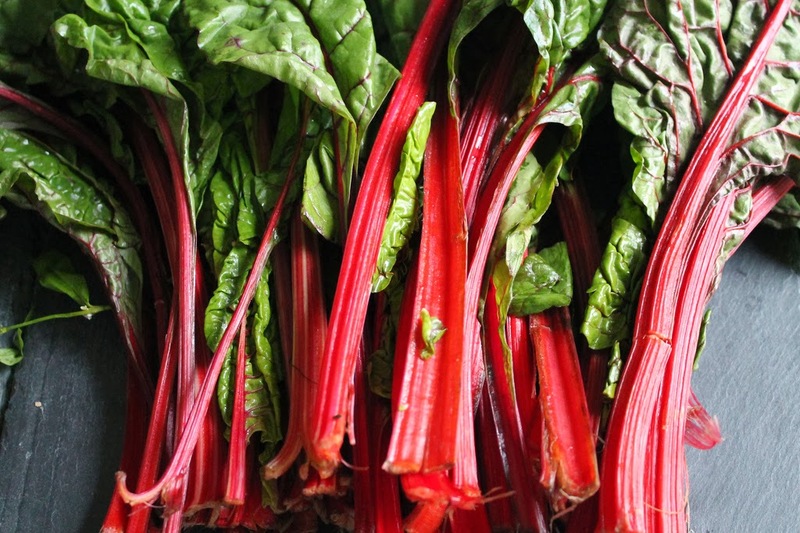 In the meantime, tightly pack the chard stems into a glass jar and set aside. Remove the saucepan from the heat and allow the brine to cool slightly, about one to two minutes. Pour the brine into the jar, being sure to cover the chard stems completely. Allow to cool to room temperature. Seal the jar with a tight fitting lid. When kept covered and chilled, the pickles will keep well for 1-2 weeks. I want to make these with my harvest for this year to give in gourmet gift baskets for the holidays. I was thinking, these, some homemade chevre, and a bottle of homemade dandelion wine. Do you have instructions for canning these? I found one other recipe for canning pickled chard stems, but it calls for 2 different vinegars, totaling 1.5 cups of vinegar, for the same amount of chard. Can I achieve the same percentage of acidity with just 1 cup of vinegar? Thanks so much! PS- how spicy are these? Thanks for stopping by! That sounds like an amazing gift basket, one I'd certainly love to receive! To answer your questions: the recipe is not terribly spicy. However, you can certainly lessen the amount of red pepper flake by about half. 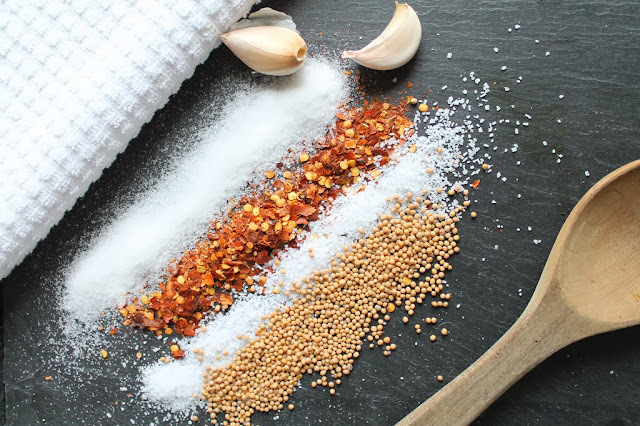 I've done this myself from time to time and have found that so long as you keep the garlic amount the same the recipe is still very flavorful. I've always made these as a "quick pickle" and have never canned them myself. However, based on my canning experience, I'd imagine that you can follow the recipe using just 1 cup, which is still more than enough acidity to keep them safe while they hang out on the shelf in the off season. Hope this helps!